Jana DeZwarte shouted out "I LOVE YOU PELLA!" when she accepted the ICTA Award for Actress in a Featured Role for her portryal of Miss Hannigan in "Annie." The Iowa Community Theatre Association (ICTA) held their annual festival in Newton this past weekend. Union Street Players (USP) has been a long time member and supporter of ICTA, though it has been a long time since USP has actively engaged in the annual ICTA festival and competition. This year, ICTA was looking for a member theatre to perform at the festival, and so a group of cast from USP’s recent production “Vintage Hitchcock” chose to perform one of the three Hitchcock radio plays at the festival. While most of the festival productions were part of a national competition (winner moves on to regionals with the chance of moving on to the national event), USP chose to be a “showcase” production at the festival and not engage in the competition. Nevertheless, Jonathon Gregg and Mark Moreland, two of the ensemble troup who performed “Vintage Hitchcock” were awarded for “Excellence in Character Acting” by the festival judges at a ceremony on Sunday morning. 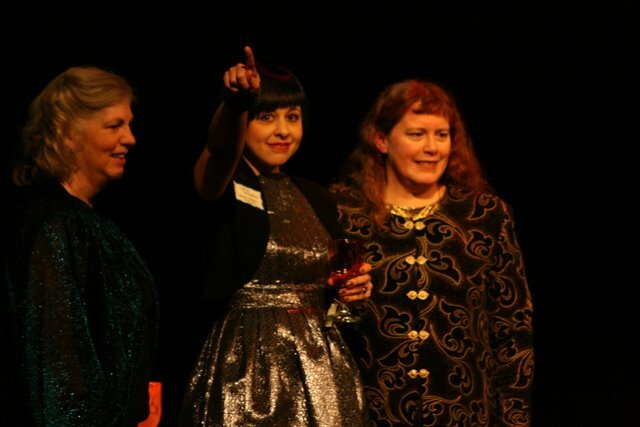 On Saturday night, ICTA awarded USP’s Jana DeZwarte their annual “Award of Excellence” for an Actress in a Featured Role. Jana won the award for her portrayal of Miss Hannigan in last December’s production of Annie. USP is proud of our productions and the incredible group of actors who grace our stage. Congratulations to Jana, Jonathon and Mark! 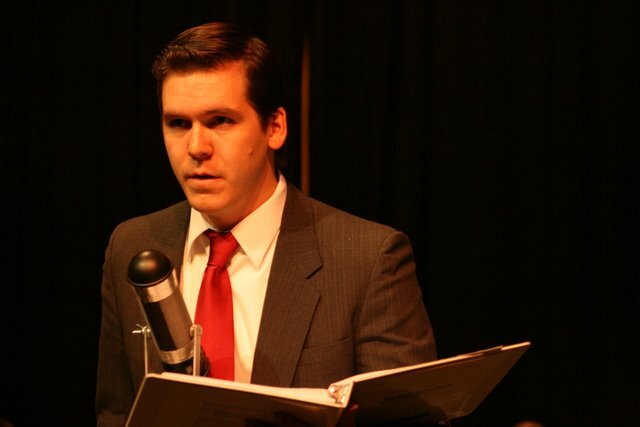 Jonathan Gregg in "Vintage Hitchcock"
Mark Moreland in "Vintage Hitchcock"
Union Street Players finished their run of Joe Landry’s “Vintage Hitchcock: A Live Radio Play” on Sunday afternoon. 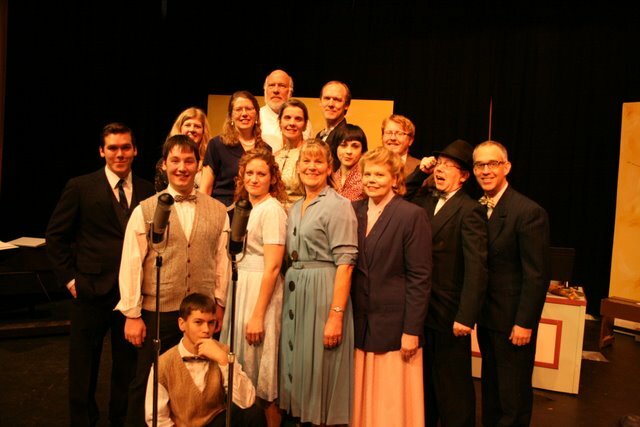 The show recreated what it was like to be in the live studio audience for the live broadcast of Alfred Hitchcock’s radio dramas. It was a completely new concept for many audience members, while those who grew up in the Golden Age of Radio found themselves taking a trip down memory lane. “I just closed my eyes and I was back in childhood with my family huddled around the radio,” on audience member said after the show. As with most spring productions, attendance was low. Though, with the show falling on spring break week, the numbers were unusually slim. 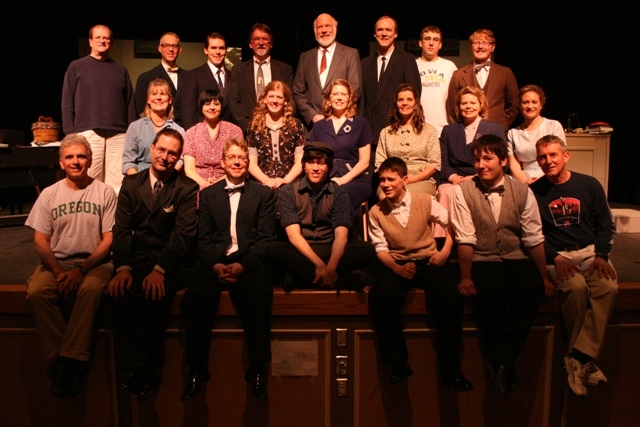 While the curtain has dropped for the last time on this Pella production, several members of the cast and crew are taking a piece of the show to the Iowa Community Theatre Festival in Newton. The annual festival of the Iowa Community Theatre Association features productions from community theatres around the state. Productions at the festival are judged, with one show going on to regional competition. USP plans to produce one of the three Hitchcock pieces, “Sabotage,” for the festival. 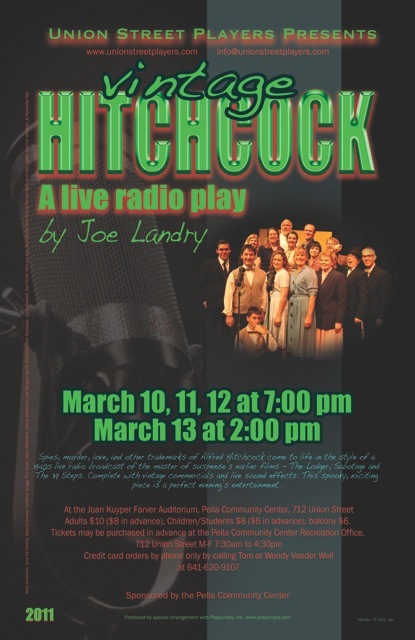 “Vintage Hitchcock: A Live Radio Play” March 10-13! Help us get the word out. Please pass this promo of USP’s “Vintage Hitchcock” along to friends and family! Tickets are on sale now for the Union Street Players’ March production of Vintage Hitchcock: A Live Radio Play. It promises to be thrilling and fun for the whole family. Spies, murder, love, and other trademarks of Alfred Hitchcock’s classic thrillers come to life in the style of a 1940s radio broadcast. 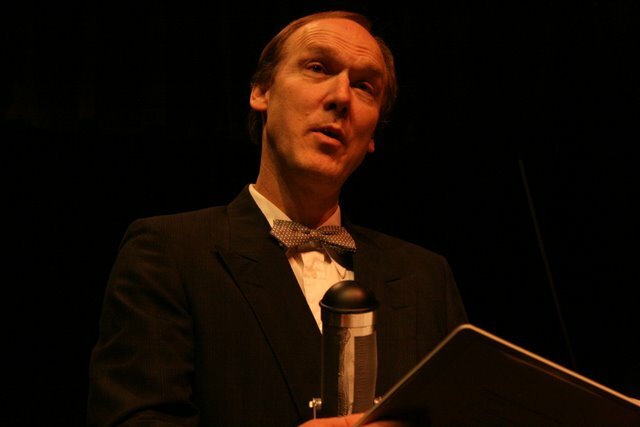 A triple feature of the master of suspense’s early films, The Lodger, Sabotage and The 39 Steps, Vintage Hitchcock: A Live Radio Play comes complete with vintage commercials, a daring train chase, a serial killer’s ominous presence, and a devastating explosion through the magic of live sound effects and musical underscoring. Performances will be; Thursday March 10 at 7:00 p.m, Friday, March 11 at 7:00 p.m., Saturday, March 12 at 7:00 p.m. and a Sunday matinee on March 13 at 2:00 p.m. Tickets may be purchased in person at the Pella Community Services Office in the Pella Community Center M-F 7:30-11:30 a.m. and 1:30-4:30 p.m. Tickets may also be purchased by phone using a valid credit card (Visa, Master Card, Discover) by calling Tom or Wendy Vander Well at 641-620-9107. In the cast are Kelly Anderson, Jana De Zwarte, Beverly Graves, Jonathon Gregg, Phil Hoole, Mark Moreland, Nancy Moreland, Lisa Morgan, Sandy Olsthoorn, Tyler Rezapour, Jacob Rosdail, Paul Scott, Michael Still, Tom Vander Well, Wendy Vander Well, Arvin Van Zante, Spence Ver Meer , and Alexander Wei. The show is directed by Pat Moriarity with assistance from Marty Feeney. Assisting on the production team are Arvin Van Zante, Cody Kooi, Peggy Moriarity, Nancy Moreland, Anne McCullough Kelly and Mat Kelly. The Union Street Players are sponsored by the Pella Community Center. “Vintage Hitchcock” Tickets On Sale! Tickets for Union Street Players production of “Vintage Hitchcock: A Live Radio Play” are now on sale! Tickets may be purchased in person at the Pella Community Services Office in the Pella Community Center M-F 7:30-11:30 a.m. and 1:30-4:30 p.m. Tickets may also be purchased by phone using a valid credit card (visa, master card, discover) by calling Tom or Wendy at 620-9107. Thu Mar 10 at 7:00 p.m.
Fri Mar 11 at 7:00 p.m. Sat Mar 12 at 7:00 p.m. The Pella Community Center is at 712 Union Street, two blocks directly south of the Pella square. It is the old high school building located directly west of the Pella Public Library. To get to the Community Services Office for tickets, it’s best to enter the back door of the building just off the alley between the Community Center and the Library. Once inside the back door, go down the steps and turn to your left. The office will be right in front of you and you’ll find the ticket board just inside the door to your left. Union Street Players (USP) starts 2011 with a fun twist on some classic thrillers. Vintage Hitchcock: A Live Radio Play takes three classic scripts by the master of suspence, Alfred Hitchock, and allows us to experience what it was like to be a live studio audience in the golden age of radio. USP Walk of Fame member, Pat Moriarity, sits in the director’s chair for the very first time and helms the production. Former USP President and veteran director, Marty Feeney, will work along side Pat as Assistant Director. 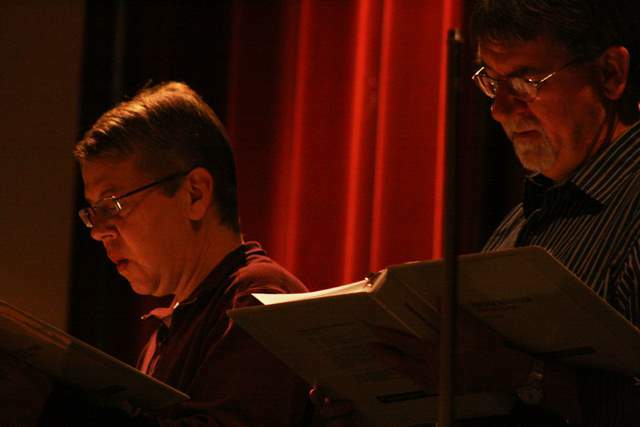 Pat Moriarity and Marty Feeney Direct "Vintage Hitchcock: A Live Radio Play"
The ensemble cast will serve as voice actors playing multiple parts. The cast will also help create sound effects, just like it was done back in the days before television. Phil Hoole & Paul Scott Read for Auditions of "Vintage Hitchcock: A Live Radio Play"
Auditions are next week for the Union Street Players production of Vintage Hitchcock: A Live Radio Play. . Spies, murder, love, and other trademarks of Alfred Hitchcock come to life in the style of a 1940s live radio broadcast. Vintage Hitchcock: A Live Radio Play is a triple feature, complete with vintage commercials, that recreates a daring train chase, a serial killer’s ominous presence, and a devastating explosion through the magic of live sound effects and musical underscoring. USP is looking for 5+ men, 5+ women, sound effects personnel, jingle singers, and a keyboardist. Auditions will be Monday January 10 at 7 PM, Wednesday January 12 at 7 PM and Saturday January 15 at 9:30 AM. at the Pella Community Center, 712 Union. No roles are pre-cast and all adults are encouraged to try-out! 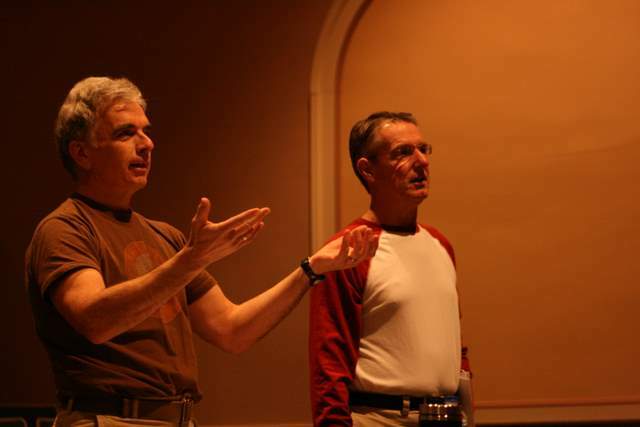 Directing the show is Pat Moriarity with assistance from Marty Feeney. The Union Street Players are sponsored by the Pella Community Center. For more information please call Pat Moriarity at 641-628-1549 or 641-780-0778 or go on-line unionstreetplayers.com.